The penultimate episode of Season 5 can only be described with one word – epic. Starting off from where "The Variable" ended, we see Daniel Faraday shot by his mother, Eloise Hawking. Jack and Kate, attempt to flee the scene but are captured by the Others. Eloise seems eager to learn more about Faraday - and the journal that she gave him (I mean, will give him). Back at the Barracks, Stuart Radzinsky interrogates Jim LaFleur, wanting to know where Kate and the Hostiles are. Just when I thought good ol' Stu had reached his maximum capacity of annoyingness, we see him at his worst. Not only does he undermine Horace's authority, but he also defies Pierre Chang's orders to stop drilling at the Swan! I had always thought of Chang as the head of DHARMA -- it didn't seem right for Radzinsky to be above him in the DHARMA hierarchy. Back in 2008, Locke returns to his people, the Others, and talks to Richard for the first time in three years (but for Locke, it seems like much less than three years). Locke, Ben, and Richard travel into the jungle to help the 'other Locke'. Richard mends Locke's wound, and sends him off on his mission (a scene from "Because You Left"). Later back at the Others' camp, Locke does something that makes even Richard wary -- he tells the Others that they are all going to go see Jacob. But that isn't the worst part -- as they are going on their pilgrimage, Locke reveals to Ben what his real mission is - to KILL Jacob! This couldn't have been more of a shocking twist in the plot - it was a classic way to end the episode, and leave us craving for the upcoming finale. Also, the look Ben had on his face at the end is the most classic Benface I have ever seen. 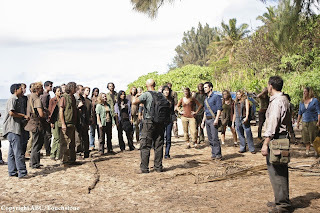 One of my favorite scenes in this episode was the long-awaited return of Sayid. Back to 1977 - Erik, Richard, Eloise, Jack, and Kate head towards a waterfall (a secret entrance into the Temple). Just when we thought things couldn't get any better, we see the epic return of Sayid (last seen fleeing from Dharmaville after killing young Ben in "He's Our You"). Jack fills in Sayid on his plan to detonate the bomb - something that Kate doesn't fancy. This brings up another question - why is Jack so adament on detonating the Jughead? Is it really worth erasing their lives? Sure, they have been through a lot of pain like Jack said - but it wasn't all pain and misery, like Kate said. This reminds me of Locke's statement from "The Little Prince" - I needed that pain, to get to where I am now. Locke shows some audacious leadership in this episode. After three years apart from his people, he makes a shocking return - and he doesn't take some time to relax and drink some Dharma Iced Tea. Locke makes sure his 'advisor' Richard Alpert, as well as Ben, know that he is in charge. He tells the Others that they take orders from someone they have never seen - the ominous, mysterious, and enigmatic Jacob - seen very briefly in "The Man Behind the Curtain" and "The Beginning of the End". But Locke has no intention of letting his people commune with Jacob - he wants to actually kill him. Could this mean that Locke wants to gain absolute leadership of the Others? Locke doesn't seem like someone who wants to take orders from anyone, even if it is someone with special communion with the Island. One of my favorite character this episode was Pierre Chang. He finally realized that Miles Strame is his son. And Miles sees the real reason why Chang forced Lara and himself to leave the Island - it was to protect them. Chang is definitely my favorite DHARMA member, and I wasn't happy when Mr. Head of Research defied his orders. One very interesting scene from this episode is Sun's conversation with Richard. According to Richard, he watched Hurley, Jack, and Kate all die thirty years ago in 1977. The first thought that struck me was, could Richard possibly be lying? I have always held on to the hope that our 1977 crew would reunite with the present 2008 group. Could they really have died in 1977? I'm guessing this answer will soon be verifed one way or another come the finale next week. Overall, I was extremely impressed with this episode. This episode was stellar - and in my opinion, even surpasses last week's milestone 100th episode. We had some new revelations from Richard, a dark descent down the Temple tunnels, Radzinsky torture LaFleur, Chang send his wife and son on the sub, and Locke make a statement that will forever send chills up my spine - "I'm going to kill Jacob."